There is nothing more luxurious while on vacation than indulging in the hotel Spa. 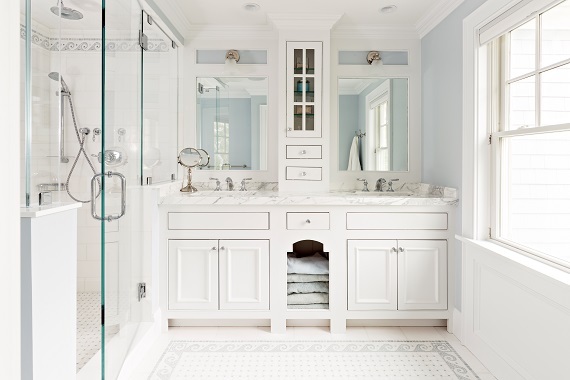 We at Thomas J. O’Neill, Inc. understand and embrace that very principle in our design and construction of our client’s most intimate room; the Bathroom. As a foundation for this important room, we have found that clean and white, honed and polished are the surfaces of the luxury client. To this end we use the fresh white Thassos and Statuario to frame our distinctive mosaic floors. The mosaics themselves come from a variety of different places to create an exclusive look that matches the client’s taste and style. They typically choose a soft sky-blue or muted Ming green that mirrors the coastal location of our homes. The floors are honed or partially tumbled for a soft matte finish. We find, however, that our clients prefer the vanity counters to be polished for a clean smooth touch. We hand choose the slabs, marble pieces and tiles that go into the creation of these luxury bathrooms. Showers are the beginning and ending of most days and as such we incorporate the extra luxuries of multiple shower heads, bench seats, steam units, clear glass walls and dedicated lighting. 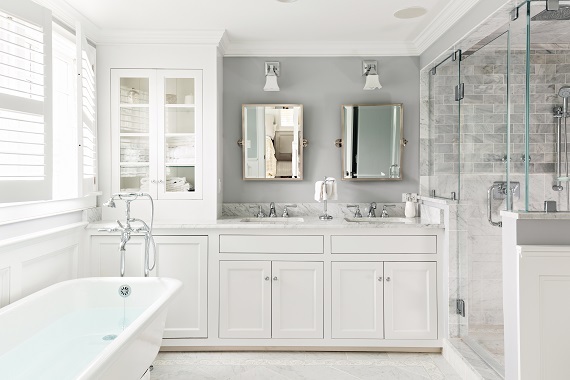 We build tasteful, timeless custom cabinetry and built-ins to esthetically accommodate the vanity area using pure white bead-board that compliments the home. Lighting and mirrors complete the space for a polished, convenient and accessible finish to the room.